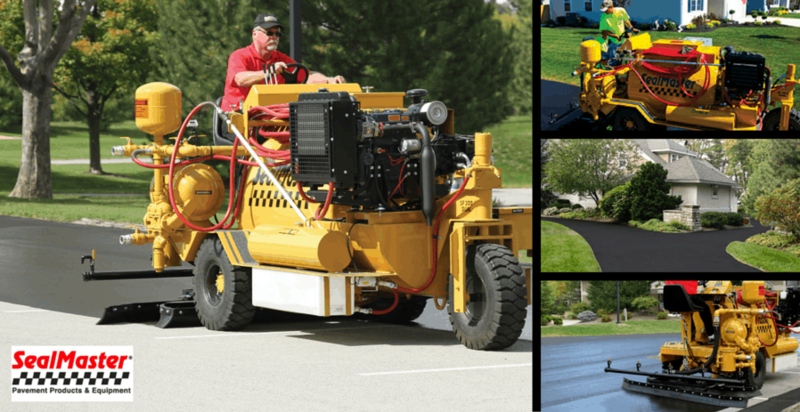 SealMaster is one of the world’s largest manufacturers of pavement sealer and sealcoat with over 100 pavement sealer manufacturing plants and distribution centers in the U.S. Pavement maintenance professionals rely on SealMaster as their key supplier of sealcoating and pavement maintenance products and equipment to repair, protect, preserve and beautify asphalt pavement surfaces including parking lots, airports, roads, driveways and sport surfaces. We recently spoke with Darrel Stein, owner of SealMaster in Allentown, Penn., to learn more about why he chose the franchise, what a typical day looks like for him and what advice he has for others looking to own a franchise. This is my 20th year with SealMaster. What were you doing before becoming a franchise owner? I owned and operated a medical staffing franchise — placing medical professionals in temporary positions in hospitals and nursing homes. Why did you choose your franchise? Prior to launching SealMaster, I did plenty of research into franchise opportunities. Essentially, I was looking for a franchise that had a lot of growth potential, something I could build and expand. Unlike some other concepts out there, SealMaster provides you the ability to grow this into a large entity. That really appealed to me. I also like that it is an equipment, asset-based franchise versus one that provides a service. And, SealMaster offers larger territories than most franchises. What were some of the challenges you faced when starting your franchise? I struggled initially with the fact that the industry was poorly educated when I first joined it. The SealMaster system creates a lot of support to upgrade the industry, to bring it into the 21st Century. Where did you research or get advice about starting a franchise? At the time, I was using the American Franchise Association. Mind you, this was in the mid-‘90s and our Internet connection was limited to slow dial-up. I was also using business brokers and talking to several of them to figure out the best franchise for me. I ultimately worked with a business broker — SealMaster was a great option for me. How much did you spend before your doors were officially opened? I spent about $750,000 in total seed money. In total, it took me 90 to 120 days to get up and running. My role is to manage the operations. I overlook all types of functions, everything from sales, to the finances to production. I have supervisors in all categories. A lot of what I focus on is sales and marketing. My role is primarily one of a mentor and manager to my team: I’m asking what are we doing, where are we going and how can we get bigger and better. I manage a staff of more than 30 people, so that keeps me very busy. In the SealMaster system, by far the biggest piece of the puzzle is being an effective sales person and marketer. You have to have a strong approach, a good team working with you and the right mentality. What would you do differently if you had to do it all over? I keep going back to the sales component: I probably would have been more aggressive and brought in more sales people right away. Currently, I have six sales people. I probably would have ramped up that component earlier. Simply put, sales are how you move the needle. We see ourselves expanding and growing. I’m hoping in three to five years, our business has grown by 30 percent or more. I envision adding more distributors, more sales team members and widening our product line. What is one trend that really excites you? SealMaster has new products coming out on a regular basis, and we’re continuously upgrading. There are some exciting things on the horizon that provides a great deal of potential for me and other franchise owners. Do you (or did you ever) have a mentor? I can’t really think of one coach or mentor. I’ve been managing businesses for years, and a lot of my training has been through on-the-job experience. I’ve been doing mentoring for the SealMaster system for some of our newer franchisees. I’m the “senior franchisee” now. What advice do you have for others looking to own a franchise? Prepare to work a lot… but the rewards are big. Once you narrow down the franchise concepts you’re targeting, really do your homework on each of them. Ask the current franchisee owners too about their experience with the system. Make sure you’re making the best decision for you. Would you recommend others be franchisees? Why? If you have sales skills and abilities, then SealMaster is a fantastic company for you. The ability to create wealth for yourself within SealMaster is staggering. On another note: I would be leery of franchise systems that are too turnkey. Where can people get more information on SealMaster franchise opportunities? Where can people find SealMaster on social media? Next articleAre You An Ideal Franchisee?